My new article about ancestral character estimation under the threshold model is now available online 'Accepted' (i.e., final submitted pre-proof ms.) at the journal Evolution. 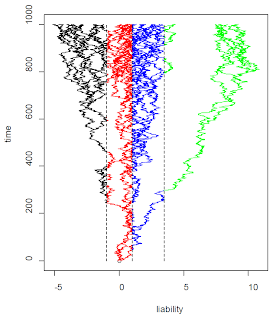 In this manuscript, I develop a new approach based on Bayesian MCMC to reconstruct the states for an ordered, discretely valued character at internal nodes of the tree based on the threshold model from evolutionary quantitative genetics. Under the threshold model, the state for a discrete character is determined by an underlying, unobservable continuous trait called liability. Whenever liability crosses a 'threshold' value, the discrete character changes state. 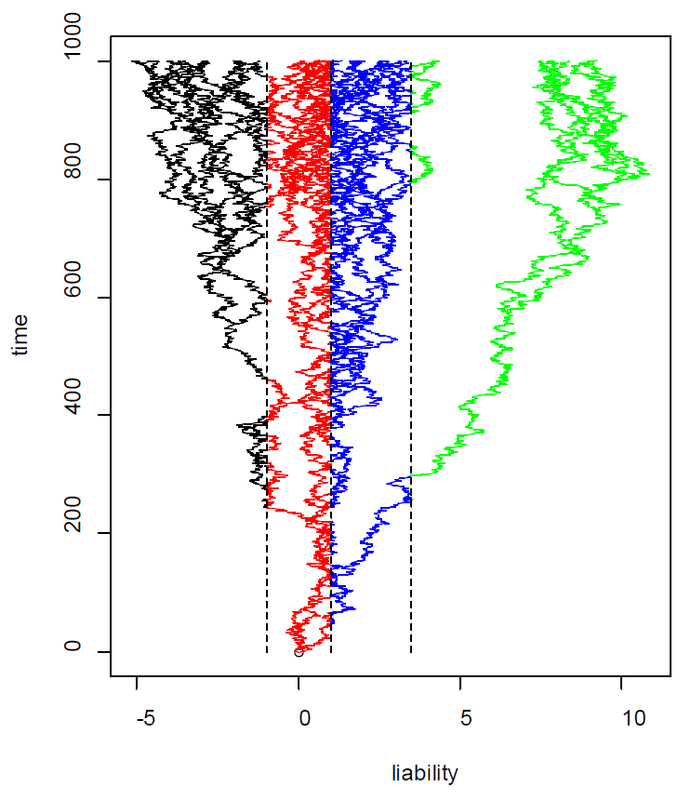 In the figure above (which is from my article), I have simulated the evolution of liability on the branches of a tree using Brownian motion, and the plotted color changes track changes to the discrete character. The threshold model is originally due to Wright (1934); however, it was first used for phylogenetic comparative analysis by Felsenstein (2005; 2012). My contribution is relatively minor. I just show how this model can also be used in the endeavor of ancestral state reconstruction for discrete characters using Bayesian MCMC; and that when the evolutionary process is 'threshold-like', ancestral states are more accurate that the states reconstructed using existing alternative models. Unfortunately, the appearance (not content, so far as I know) of the equations in this pre-release article version are messed up. Hopefully that is fixed in the proofs! Please feel free to contact me if your institution does not have access to Evolution and you would like a copy of this article. I would be happy to send you the PDF.